I am under no delusion that I am anything close to a frontrunner in the Democratic primary for the 2020 presidential election, right now. Stranger things have happened than a retired US Air Force Senior Master Sergeant with a strong devotion to his country and a lifelong study of his nation and world affairs suddenly catching the nation’s imagination and surging to the lead against A-list candidates. But, the odds of that are vanishingly small. Our nation faces four dire, truly grave threats, and I will do all I can to defend my nation against them. Your nation needs you to fight against them, too. If you cannot be directly involved, support me. I will fight for you. The landing page for this website makes the case for impeaching the sitting US President for engaging in treason. Our Constitution defines treason as providing “aid and comfort” to enemies of the United States. When Donald Trump shields Putin and Russia from US retaliation for his attack on our 2016 election and when he refuses to defend our 2018 election against ongoing attacks, he is providing aid and comfort. He is engaging in treason. Treason is the first grounds for impeachment in our Constitution. Impeachment by the House is followed by a trail in the Senate. Trump will have a defense there. It is important to note that this is an indictment and trial. It is not a political “assassination.” It is a process of finding out whether or not the President in fact has engaged in treason and whether or not he must be removed to spare our nation more harm. There is no good reason to allow a treasonous US President to remain in the Oval Office with access to power that can be used to cause us grave harm. There is every reason to defend our nation against this danger. We must impeach Trump now. Contrary to the protestations of the US President, climate change is not a “Chinese hoax.” It is a real threat. Indeed, if we did not have a treasonous US President, it would be the gravest threat we face. Our Department of Defense has repeatedly cited the danger global warming and the resulting changes pose to our nation’s defense. This MUST NOT be ignored. Meanwhile, climate change is expected to drive human migration, causing some 50 million people or perhaps more to cross international borders in search of survivable habitats. One need look only briefly to the current attitudes toward migration here and abroad to see the conflicts and suffering that will follow. Border walls and fences will condemn millions to deprivation, disease, and famine. Failing to address the causes of climate change and dealing with the consequences everywhere, will assure that this human tragedy will happen. We must work globally to mitigate the suffering that will cross borders and oceans otherwise. And, we need to act here in the United States. A national program to immediately deploy solar, wind, tidal, and wave power generation would be a jobs program. It would be an infrastructure program. It would be an economic moderation and a national security program. It is an absolutely necessary part of our immediate future if our children and grandchildren are going to have any future at all. We live in the 21st Century. We need 21st-Century solutions, not hazardous 19th-Century solutions. We need solutions that do not poison our water, poison our air, and poison our children. We have the means to implement those solutions now. It will be to our lasting and soon irreversible shame if we fail to do so. 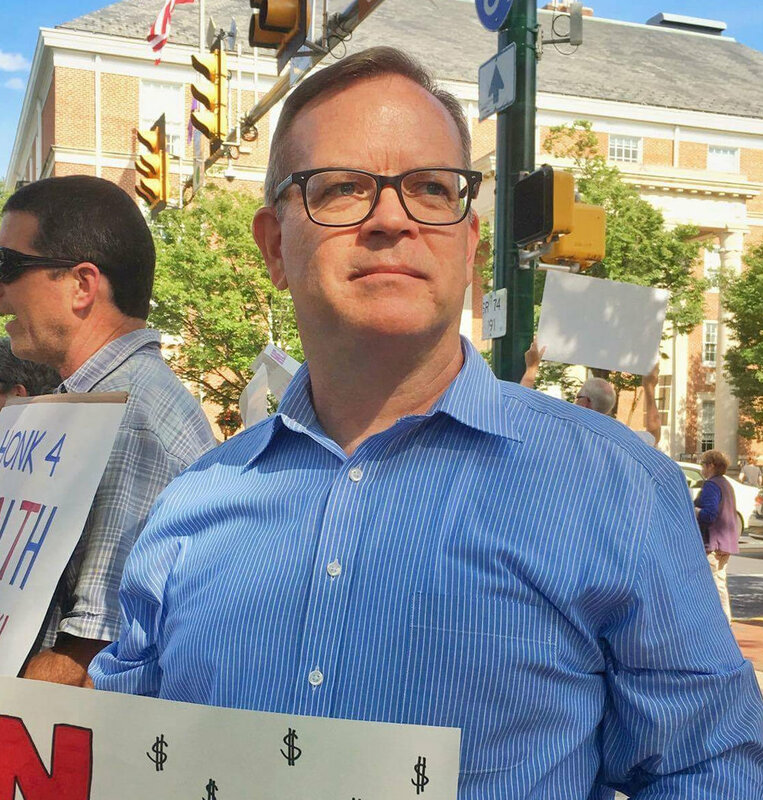 In January of 2017, I launched a campaign for Pennsylvania’s 11th Congressional District. When asked why I launched such an apparent longshot bid against the incumbent, Lou Barletta, I had a simple response. Lou Barletta, is a racist. Donald Trump is a racist. The racist duo of Trump and Barletta posed a threat to my friends and neighbors in the 11th District, and I was determined to defeat that threat. (Barletta is now running for the US Senate in Pennsylvania, increasing the danger.) I am a determined foe of racism. Racism is more than a threat to its targets. Racism destroys societies. Racism destroyed Germany in the middle of the 20th Century. Racism has been degrading our nation throughout its history. One motivation for President Johnson signing the 1964 Civil Rights Act and the 1965 Voting Rights Act was Soviet criticism of American hypocrisy in supporting human rights on the international stage while enforcing Jim Crow laws in the United States. Racism demeans our nation. Racism is rising under our racist President and his sycophants like Barletta. Racism must be defeated. We must treat domestic hate groups that have a history of attacking, terrorizing, or murdering Americans the very same way we treat international terrorist groups that have attacked, terrorized, or murdered Americans. When we say al Qaeda or ISIS cannot set up an office in the United States while we are providing First Amendment protections to the KKK and neo-Nazis, we are instituting racism. We must end this now. We must stop allowing police departments and friendly prosecutors to investigate their own shooting of unarmed black men. They have shown that they are not up to the task, and any decisions they reach are stained with an obvious conflict of interest. Neutral judges must review all such shootings. Panels of retired judges also should review regular judicial decisions to find and repair trends that indicate unjust, unfair treatment of minority defendants. Normally, this would be the purview of the US Justice Department. However, the DoJ is under the leadership of Attorney General Jeff Sessions. Jeff Sessions is a racist. We need a separate body, one not led by a racist, for this role. We must restore the protections of the Voting Rights Act. The wildly erroneous 2013 Supreme Court ruling that undermined this very necessary law, which had been broadly supported in its renewal in Congress, has unleashed a disaster for minority voters and for our Democracy. Voting suppression efforts are rampant in a nation that needs votes for its very legitimacy. Congress can fix this. Congress must fix this immediately. Income inequality was at very high levels before the 1929 Great Recession, before the extreme market crash in 2000, and before the start of the Great Recession. High levels of income inequality create dangerous economic instability that leads to economic disasters that hurt all Americans and that hurt our nation. 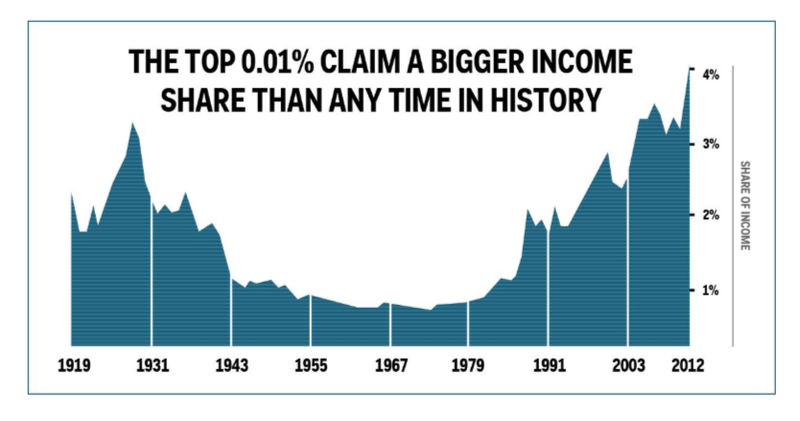 Income inequality is higher now than ever before. The tax policies of Trump and the Republican-led Congress are making the danger grow faster. As you can see in the charts below, income inequality had been at lower levels from 1940 through 1980. It began rising dramatically after President Regan cut the top marginal tax rate from 70 percent to 50 percent and then to 28 percent. The rapid increase in income inequality that followed these cuts was not a coincidence. It reflects a direct, cause-and-effect relationship. It was not a surprise. It was predictable, just as the increase coming after the Trump cuts was predicted and is happening. Meanwhile, the already wealthy are seeing their wealth skyrocket. We can fix this by supporting unions and enacting increases in the minimum wage. We can change payroll taxes for Social Security and income taxes to provide a fairer deal for working- and middle-class Americans and get our extraordinarily wealthy Americans—who owe their wealth to those very working- and middle-class earners/consumers—to bear a greater burden. See “Taxes” under the “Issues” link.) They paid higher taxes from 1940 to 1980, and while they did, we became the strongest nation on Earth. Since we cut their tax burden, we have watched our nation decline. No more. Fixing this income-inequality problem allows us to dramatically reduce or end our structural budget deficits and allows us to fix things like an inadequate education system, failing infrastructure, and a health-care system that costs too much for too little and leaves too many without care. Like the other threats above, fixing income inequality protects our nation. When we address these four grave threats to our nation, we will solve many additional problems and will be in a better position to fix the rest. I am not promising nirvana, but I am promising that we can do better. Help me defend against these threats, and we will do better.